It was last Friday morning and Kahiem Seawright was scheduled to speak at San Miguel School, a little gem of a place off Elmwood Avenue for middle-school boys.The talk was billed as Seawright telling kids the importance of staying in school, a great message for inner-city kids to hear, especially coming from someone with a similar background, someone who is scheduled to graduate in May from the University of Rhode Island.But when Seawright walked into San Miguel in his dark blue URI warmup suit, he had teammate Jimmy Baron with him. Somehow, it was only fitting. 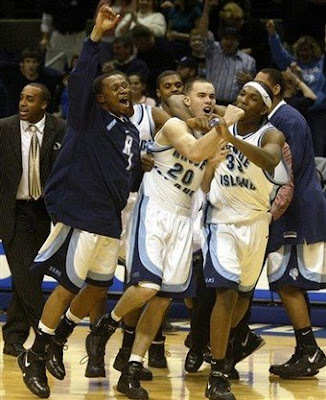 Seawright and Baron came to URI together, back there in September of 2005. In May, they will leave together. In between, they have had a journey — on the court and off it, too — the black kid from Long Island who used basketball as a passport to a better life, and the white kid from East Greenwich, the son of the coach. Two kids who have forged a deep friendship, one that transcends the fact that they are teammates. “We grew up in completely different lifestyles,” Baron said, “and we had to learn to trust each other.” The different lifestyles came out as they answered questions from the kids. “How did you start to play basketball?” one of the kids asked Seawright. “From my brothers and cousins,” he said. “I was always tailing after them. They didn’t want to take me, because I wasn’t that good, always kicking the ball out of bounds, and I was always trying to measure up.” A few minutes later, Baron was asked the same question. “Why basketball?” he said with a smile. “I really had no other choice.” The son of a coach. That was not always the easiest thing to be when he was just another recruit and about to meet one of his new teammates. The first step for Baron and Seawright learning to trust each other took place in the summer of 2005, when Jimmy Baron went to Long Island to meet Seawright. Seawright was working at a basketball camp, and Baron had driven down with his father. And from the beginning, he knew he had to convince Seawright that he was more of a player than he was the son of the coach. That he had the same dreams and aspirations any new player had, independent of who the coach was. “I remember telling him that I was just another guy, just like him,” Baron said. He still didn’t know what to expect, though. Even without the baggage of being the coach’s son, Baron and Seawright seemed so different. Baron essentially has grown up in Olean, N.Y., in a small upstate town where the only black people were the ones playing for his father. An overstatement, certainly, but not much of one. Seawright, on the other hand, had to find out if he could trust Baron. “I had to find out if he was going to be the snake in the locker room,” he said with a smile. For all locker rooms have their own realities, just as all teams do. Teams are fragile ecosystems, almost by definition, an assemblage of egos and dreams and ambitions, all played out within a framework of too few minutes and too few shots to go around. Teams being betrayed by players who don’t get along behind closed doors is probably as old as sport itself. And could there be anything more potentially damaging as having the coach’s son on the team? Much has been made of both how difficult it is for fathers to coach their sons, and for sons to play for their fathers. It’s always a loaded situation, even when the son can play, as was clearly evident from the beginning with Jimmy Baron. But what about the other players? How do they deal with the coach’s son? Can they be comfortable complaining about the coach –– a practice as old as the game itself –– in front of the coach’s son? Was the son going to be the snake in the locker room? That, too, was part of the equation, something that had to be resolved. They are seniors now, of course, and are the leaders of this URI team, along with Jason Francis, the other senior. And their roles are defined. Seawright and Francis are the enforcers. Baron is what Seawright calls “the consoler,” for the simple reason that he has the same name as the coach, and thus must have a different voice. And maybe most of all, Seawright and Baron came to know that, in the end, their similarities were more important than their differences. Came to know, as Baron says, “Whatever we did here at URI, we were going to do together.” They have done a lot. To their everlasting credit.